The OC Mama: Making the wine! Last night I went to my friend's house and we had a little party. Everyone in the group is a nanny, or was at one time, even though half of us are "retired" and home with our own children, or have moved on to other careers. 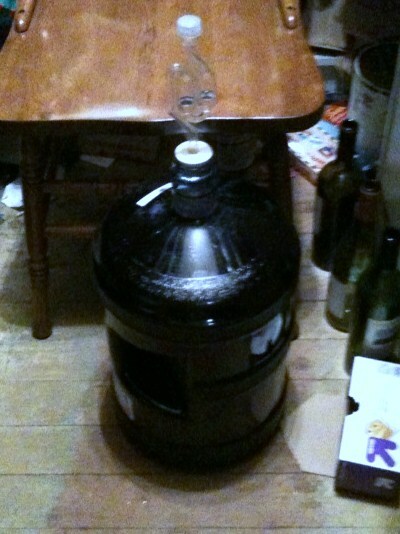 Anyway, for the last year or so we've been making wine. We've done a lot of fruit wine which is really simple to make, and it's pretty cheap too, and well it's like drinking juice with a kick! ha. This time though we tried a wine kit, to make a red wine. Fourteen weeks ago, the first stage was completed and it was left to sit in my friend's pantry. Last night we moved on phase two, which may have involved the consumption of a lot of wine and then having to follow the directions on the wine kit for the batch currently being made. Next time we should do the wine making first, then the drinking. Ha. (Not that I personally was in any way intoxicated at this point, but I can only speak for myself. )This was the first time I've really been involved in this stage of the process, so it was fun to see what all had to be done. Trying to siphon the wine from the bucket to the bottle for the next stage was pretty entertaining. Next time I'll take pictures. So eventually we got the wine stirred and siphoned and some ingredients added and it should be ready around Christmastime. I'll let you all know how it turned out. The only downside to the night was after we made the wine, we watched a movie (the Blindside, it was really good! I hadn't seen it before) and my foot fell asleep while sitting on the couch. So when I stood up, I managed to trip and hurt myself. I spent the rest of the night with my foot up and an ice pack. It's great to be in a room full of nannies when you hurt yourself. They took good care of me. :-) So I'm sore today, and my foot is swollen and a little bit purple. I should probably go to urgent care, but I really don't want to deal with the hospital and waiting forever today. I think I'm hoping it will just get better on it's own. Hopefully I didn't hurt it too badly, I'm supposed to do a 5k in San Francisco in a couple of weeks.